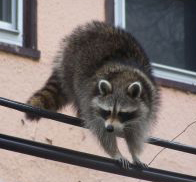 Squirrel, Raccoon & Bird Control :: Kingsway Exterminating Co.
We will tailor a specific program to eliminate and control your particular problem. Squirrels and Raccoons may seek shelter, entering your home through an open hole(s) or creating their own entrance to warmth. Once they feel comfortable inside, Squirrels and Raccoons may choose to stay even when the weather turns warm again. We will inspect the entire premise thoroughly to find all squirrel openings. We will use repellent, bait and trapping methods to flush the squirrels / raccoons out of the occupied areas. Setting traps is also a part of the control procedure and will depend on the recommendations of your professional pest control operator. Upon elimination of the pests, our technician will patch and close all accessible openings they’ve created up to 12″ in diameter and 18″ in length. (Ladder work up to 30 ft high only.) We will also take necessary action to eliminate any additional pest the squirrels/raccoons may have been carrying on them. This will further protect you, your family and your home. Bird control is achieved through a variety of methods. Letting a bird problem go on too long could cause damage to your surroundings. Many bird infestations develop on signs, homes or rooftops and once established, may take repellents and ultimately trapping to resolve conflicts. We can help control your bird problem and eliminate potential damage to your home. We will tailor a specific program to eliminate and control your current bird problem. Our Pest Control Operator will inspect & analyze the problem areas and recommend a treatment option that is best for you. When are you available for a Kingsway Representative to come? We solve all pest, termite, rodent and wildlife issues! Kingsway Pest Control apply's N.Y.S. Department of Environmental Conservation Registered Materials, for your safety. Brooklyn, NYC-Manhattan, Bronx & Queens Bedbug & Pest Control Specialists. Website by BDD Creatives Inc.